Why can I not find a file that Windows search tells me is there? 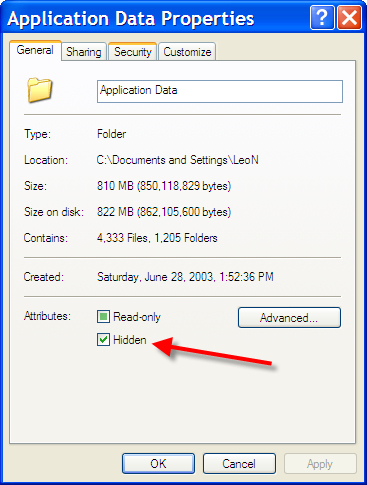 In an effort to avoid confusion, Windows will hide certain files and folders by default. Naturally that often leads to more confusion. I often use Windows XP search to find a file that is somewhere on my computer. The search query will give the path of the specific file, but then if I go into Windows Explorer and try to find the path myself, I can only find part of the path, and then a dead end. Why is this? Windows is trying to be helpful, of course! It's "protecting" you from seeing things that it thinks might confuse you or somehow it thinks just "shouldn't be seen". Of course in helping to avoid confusion it just confuses more. I know I don't want Windows to "help" me like this, so there are a couple of options I turn off every time I configure a new machine. 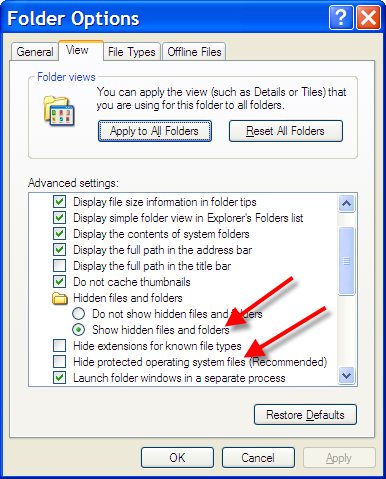 By default hidden files are not displayed in Windows Explorer. "Windows is trying to be helpful, of course!" In the Advanced Settings list, scroll down until you see both Hidden files and folders, and Hide protected operating system files. Make sure that Show hidden files and folders is selected. I also uncheck Hide protected operating system files - for much the same reason: I just don't want Windows hiding files from me. Now as you navigate to the path that the search results gave you I think you'll find that a few more files and folders are visible along the way. How do I get Windows Explorer to display details by default? Windows Explorer defaults to a simple view of the files on your machine. You can change that default to include all details by following a few steps. Another thing to mention is "hide extensions for known file types". Although it is unchecked in your screenshot, it is checked by default. Leaving this checked can cause confusion, as well as vulnerabilities to "social engineering" spam and viruses. It can be confusing, for example, to see several files all with the same name. (They have different extensions, but the default is to hide the extension.) Or, to search for "something.doc", and only see "something" in the folder. I have tried the usual stuff and no dice, icluding everything you mentioned in this answer here. I could see them a few days ago and can still see them by doing a global search. If I just search the main directory they are in, Ithe search will not see them. I have to do it at the Drive level for the search to work. This might be off-topic a little - it's more like "Why can't Windows find a file that Windows search tells me is there?" If I use Windows Search, or even navigate to the directory directly and double-click on the file, most of the time it opens OK. But sometimes (always - if I open the application first, and use the in-program 'browse' to find the file in it's directory), it tells me that "Windows cannot find the specified file. Check if you have spellt the name correctly". Sinse I'm not typing anything, simply selecting the file from a list that Windows presumably generates for me from the directory contents, how can it get it wrong? @Bob, there's a decent chance that the file is inside a zip archive, and while it can be seen it can't be executed from there. Check the path. If there's no drive letter, it's probably the results from a zipfile. I think there's a way to turn off Windows treating zipfiles as directories, if this is a problem. I am still experiencing the problem. I'm not trying to "run" a program, i'm trying to open a file. The file definately isn't in an archive. If I double-click on a file to open it with it's default program, I get the error. if I then double-click again (whether or not I close the program first) it opens normally. I have a partition that was set up for my music, but I need it for documents. The answer to that question is a definite maybe. Unless you know what each file is there for, there's no way of knowing what you can delete. As a general rule, I'd say, when in doubt don't. It is safe to delete thumbs.db files. What is thumbs.db, and can I delete it?